Trump declared a national emergency Friday to fulfill his pledge to construct a wall along the U.S.-Mexico border. Trump said he will use executive action to siphon billions of dollars from federal military construction and counterdrug efforts for the wall, aides said. SPOKANE, Wash. — Two Washington lawmakers on different sides of the aisle disagree with President Donald Trump's decision to declare a national emergency. Trump declared a national emergency Friday to fulfill his pledge to construct a wall along the U.S.-Mexico border. Bypassing Congress, which approved far less money for his proposed wall than he had sought, Trump said he will use executive action to siphon billions of dollars from federal military construction and counterdrug efforts for the wall, aides said. Congresswoman Cathy McMorris Rodgers tweeted about his decision Thursday afternoon. Senator Maria Cantwell says she also disagrees with the president's decision. Cantwell is a cosponsor of the Restrictions Against Illegitimate Declarations for Emergency Re-appropriations Act of 2019 (RAIDER Act). This legislation would prevent Trump from redirecting congressionally appropriated Army Corps of Engineers and military construction funds to build a border wall during a national emergency declaration. 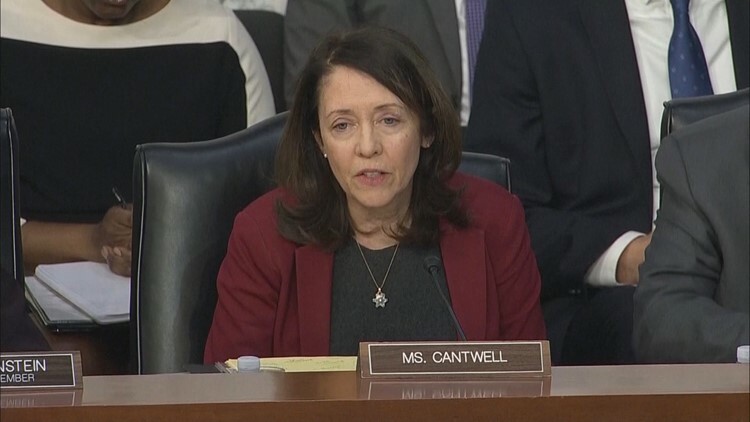 Sen. Maria Cantwell questions Facebook CEO Mark Zuckerberg on the Cambridge Analytica privacy breach during a hearing with the Senate Judiciary Committee on Tuesday, March 10, 2018. McMorris Rodgers said she voted for the bill to fund the government for 2019. She did say the bill was not strong enough on border security and failed to extend the Violence Against Women Act. The congresswoman says she voted yes because the government needed to be funded and the bill did include other wins for Eastern Washington, including funding for a new Agricultural Research Service building at Washington State University. Trump's move followed a rare show of bipartisanship when lawmakers voted Thursday to fund large swaths of the government and avoid a repeat of this winter's debilitating five-week government shutdown. Trump's insistence on wall funding has been a flashpoint in his negotiations with Congress for more than two years, as has the resistance of lawmakers in both parties to meeting the president's request. West Wing aides acknowledged there was insufficient support among Republicans to sustain another shutdown fight.